Before going into the procedure, just a few words about Estate Agents. sale usually included the Agents commission ( between 3 and 10%) and will be indicated FAI ( Frais Agence Inclus) as well as VAT at 19.6%. The dream house has been found- you love the Village and surroundings, and your offer has been accepted- hopefully after some healthy negotiation. 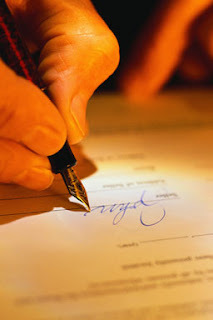 Some agencies will require you to fill out an Offer form- to be signed by both parties. This is not overly common as Agents will get you to sign the Compromis de Vente a few days after the offer has been accepted. This document is a sale agreement between the 2 parties. You will agree on what is included in the sale ( white goods, furniture etc) as well as Clauses Suspensive that will state that , for example, the vendor will build 2 concrete steps from the garage into the house before Completion. Basically, anything verbally agreed is put into writing. This document can be signed at the Agents office or at a Notaire. It can also be signed by post if you are out of the country, or you can arrange a person to do it for you - like a Notaire, friend or family member. A deposit can be requested at this stage- from 1-10%. From the date of signing,you have 7 days cooling off period. 2 important points. If the Vendor withdraws after the cooling off period, you get your deposit back as well as, usually, 10% of the agreed selling price. If you withdraw after the 7 days, the deposit goes to the Vendor. Loi Carrez. This is only in the case of a copropriété - a building that has been split up - like apartments. This measure the exact square meterage of of the property. Lead. Since 29 July 1998, this inspection verifies any traces of lead in the property. Termites/fungal and insect related damage. Since 8 June 1999, it requires a full test on all wood for insect related damage. Natural Risks. This will inform you on risks such as flooding ( largest floods on record were in 1999) and show you how your area is classified today. Gas. If the property is supplied by gas from the street, it will verify the fittings and connections and safety of installations. Swimming Pools. From 01 January 2006, the safety features of your pool are inspected. This is where the balance of the money is paid to purchase the house. The purchaser is liable to pay the Notaires fees as well as tax. This can be around 8% on top of the purchase price. Remember the Notaire is a Government Tax Collector. For Capital gains and other taxes , you are advised to take professional advice. You now have the keys to your new property. Get the bubbly out!!!! !